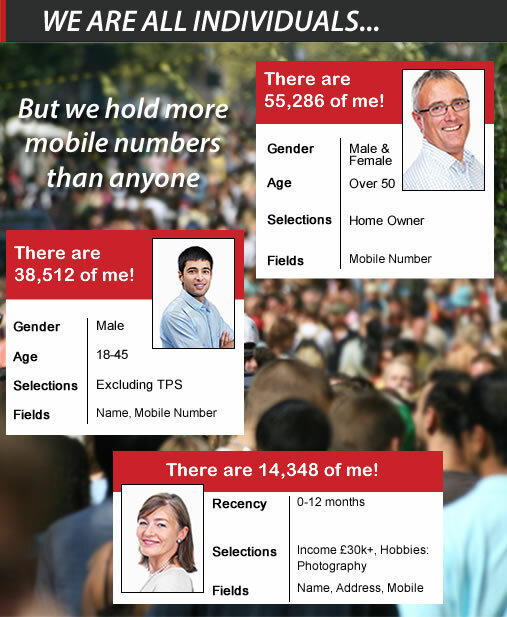 Our telemarketing database consists of over 8.7 million mobile numbers and the list is growing daily! Collated in-house from online enquires, surveys or through our UK based call centre - "The Reactiv Way"
Our telemarketing lists consist of over 8.7 million opted in mobile numbers and offers the most direct, instant way of communicating with your customers. Whether it's awareness, new product or customer retention, Mobile Marketing gives real time results and increased sales. Over 85% of adults in the UK now own and use a mobile phone and it's estimated that there are currently 87 million handsets in the UK. Already own a Mobile Database? We can check your numbers through HLR (Home Location Register), sometimes referred to as ‘network look up service’. The service allows you to check if a mobile number is valid, switched on and to which mobile network it belongs to, we can also identify ported numbers. This is a quick and very efficient cleaning method to validate which numbers are live. Reactiv's SMS platform is the perfect way make good use of your telemarketing list. Send and receive SMS messages from your targets and make good use of your data with our comprehensive message reporting system. HLR checking is also available through this service.